The sky was clear on September 13th and I planned to shoot some stars before Moon rises. I thought I had prepared everything, but turned out I hadn't charged cameras battery. Luckily there was enough power to last until Moon lit up the sky. Maybe 15 minutes more had been possible but nevertheless... everything went better than I expected. First some more tests about exposure times. 80 second was easily possible the last time, now I tried some more. 100 seconds looked good so I took 150 second. When I look at the photo on computer screen I'm not sure about 150s. Most stars look ok, but maybe some show some trailing. I have to run final tests about this on a better ground. This time the mount was a bit unstable. So I'm not sure whether the trail is caused by mount shifting on ground or incorrect alignment. 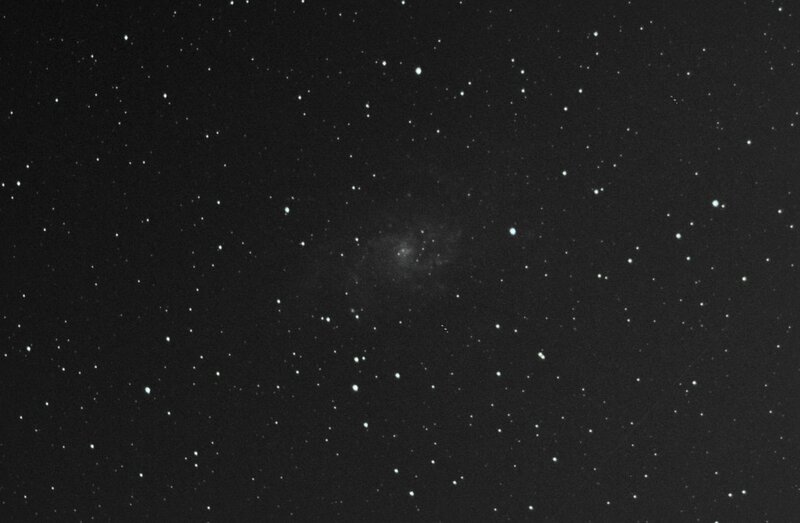 Result was something between 100 and 150 seconds so I chose 120 as exposure time for shooting the Triangulum Galaxy. This failed. Moon was rising and it's glow had lit the eastern sky. Air humidity was also quite high and some fog did form a while later so all that made Triangulum a wrong target for that night. Still I spent 10 x 120 seconds worth of time and battery on what you see above. Also I managed to tilt the camera couple times so only seven photos were usable. I'm impressed. 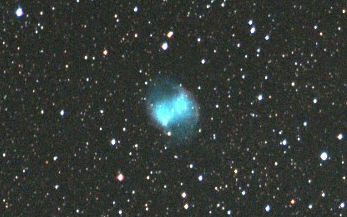 Last time I tried M27 was with my old 75-300/4-5.6 zoom lens. I got a faint gray smugde. Now the aperture was 2.8 and my faint smudge has some real color! Can't wait to take some longer exposures of this. 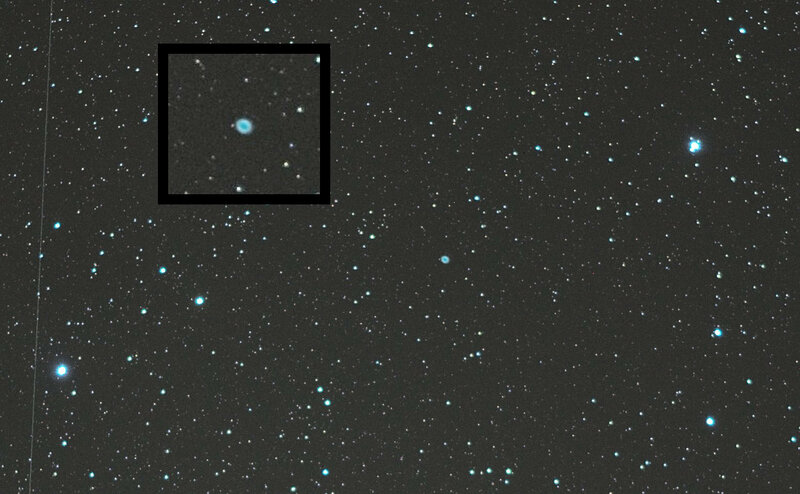 Bigger photo in https://www.flickr.com/photos/96700120@N06/15048413067/ and one with more stars around it in https://www.flickr.com/photos/96700120@N06/15047931927/. 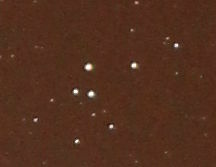 There's also open cluster of NCG6830 on the bottom if this image. 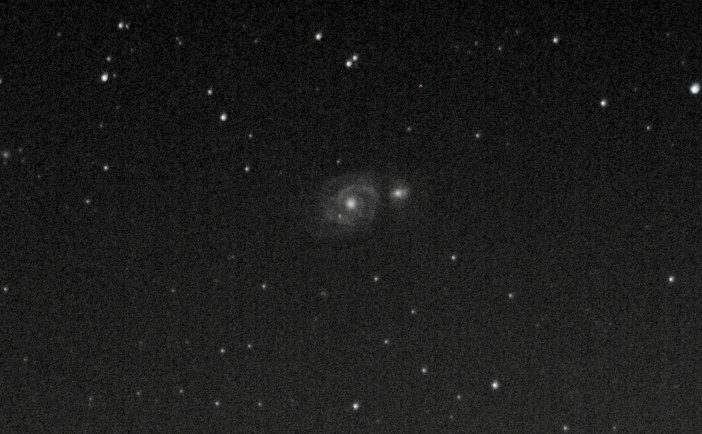 I've had problems with aligning the EQ3-2 even though I have a polar scope. For some reason I misunderstood the instructions totally. I always assumed the scope shows some kind of fish eye view and the constellations visible should cover the real stars. Nope. 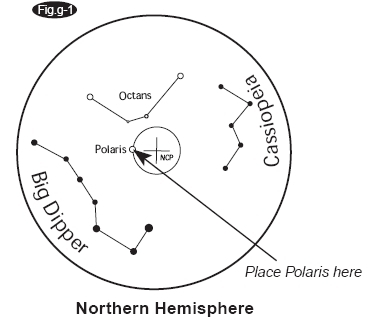 The scope shows Big Dipper and Cassiopeia from northern hemisphere and Octans from the south. Place polaris here circle is exactly as it says, but the rest are just directions where the constellation should be. This was the information I was lacking. With rough alingment I got maybe 20 second exposures with 200 mm optics without the stars trailing. Once or twice 25 to 30 seconds was possible close to celestial pole. Now I tried 30 s, 45 s, 60 s, 70 s and when that worked I took 20 exposures with 80 second time. Here's an single shot to how the stars don't trail with 80 second exposure. The Moon was up and almost half so sky was kind of lit. Before this it has never bothered me too much since my exposures were so short, but now it was a problem. I tried to stack my Andromeda photos and the result was worse than my previous best one (with 25s exposures). There's really no point of posting that image here. From nothing to this. Now I'll just wait for a better conditions (no Moon) and try again.